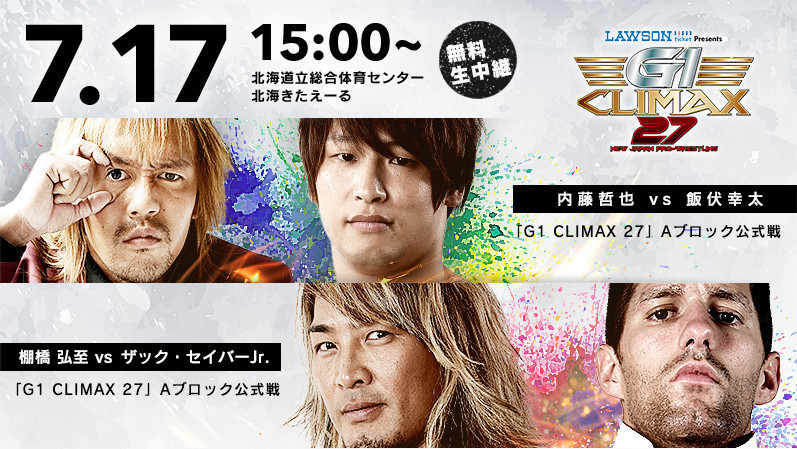 The twenty men competing in this year’s G1 Climax are introduced. This was a good opener. Everyone had a decent chance in the ring and everyone looked good, but no one really got into a super competitive frame of mind. If anyone, Juice Robinson looked like he was taking it the most seriously. He stayed in the ring for a long time for his team, and after the match he got in Kojima’s face, his first opponent in the tournament on Thursday. Good match. It started in violent fashion with Suzuki Gun attacking Bullet Club before the bell and taking them all through the crowd. This gave Suzuki Gun a huge advantage which they continued to press back in the ring. They did their usual dirty tactics, but Bullet Club managed to mount a comeback with some good teamwork. I really like how they’re setting up Omega versus Suzuki. It should be a great, violent match with the possibility of getting crazy and chaotic. They also dropped hints that Tama Tonga might not even try to defeat Kenny Omega when they eventually have to fight in the G1 Climax by saying he’s more interested in Bullet Club than winning the G1. After the match, Minoru Suzuki chases Kenny Omega and attacks him. The the disappear into the backstage area as they brawl. Good match. This one felt quick because of the nice pacing. It started with everyone a little hesitant, but it quickly became clear that the members of LIJ wouldn’t hold back very much. The match began with some nice individual efforts and moved on to some great tandem work by both teams. The pace increased gradually with the last segments of the match occurring at a very high speed. After the match, all for members of Los Ingobernables De Japon meet in the middle of the ring in a gesture of solidarity. This was kind of a comedy match, and as such, it showed how Toru Yano has the potential to do well in the G1 Climax. Okada and Gedo mostly tried to take the match seriously, but the antics of Yano and the goofiness of some of Jado’s actions seemed to get them off of their game. For that it was an interesting match and a pretty fun way to end the tag matches before tonight’s tournament matches start. Good match. It started out as kind of a typical bout, but YOSHI-HASHI started to turn up the aggression by using the barricades at ringside and slapping Nagata on the head when they got back into the ring. Nagata didn’t like that very much, and the match become much more hard-hitting from there. YOSHI-HASHI showed some nice endurance by managing to work his way out of some submissions after having been in them for a long time. I feel like Nagata is going to have a tournament similar to Liger’s Super Jr. tournament this year, meaning he won’t win much but he’ll be the sentimental favorite. A pretty good match. It was a big-man match so the pace was somewhat slower than a lot of the matches so far tonight. It was interesting to see Fale dominate Makabe which he did quite effectively. Other than the match being rather one-sided, there’s not a lot else that really caught my attention in this one. Very good match. With was another big-man match, but the pace was very high throughout. Goto and Ishii went after each other hard right from the start. There were lots of stiff strikes, lariats, and headbutts, and both men absorbed a ton of punishment. One of my favorite sequences was when they ran the ropes, each of them changing directions multiple times and chasing the other until one of them finally hit a lariat. Great stuff. Great match! Sabre used his technical skills to pick apart Tanahashi, but Tanahashi was able to counter with some big moves. Tanahashi’s injured arm was a huge target, but it seemed like Sabre wasn’t going for it. It all seemed to be part of Sabre’s plan though. This was a tough first match for Tanahashi, and it sets him up with a huge disadvantage going forward in the tournament. If Tanahashi was kind of injured before, he’s very injured now. Another great match! This one increased in pace and intensity extremely well. Naito started off being his usual self, making Ibushi wait and telling everyone to “take it easy,” but Ibushi didn’t wait long before he started pressing the attack. Ibushi didn’t fight dirty, but he fought very aggressively. Naito matched Ibushi in aggressiveness though, going after Ibushi’s neck often. The match built to the point where many near falls took place, some of them nearly unbelievable (but not quite). This was a superb way to end the first night of the long journey towards the end of G1 Climax 27. This was a very good show with consistently good matches (and a coupld of great ones). I think all of the tournament matches delivered a lot of excitement for this year’s G1 (except the Fale/Makabe match which I thought was just prety good). I also liked the way the non-tournament matches set up some increased interest for the start of B Block on Thursday. This was definitely a great main event match. As much as I liked the two matches that preceded it, Naito and Ibushi put on a show that was on another level. This was the first night of the G1, so they needed to start things off in a good way. They certainly did. TAGS: Bad Luck Fale Bullet Club Bushi Chaos Chase Owens David Finlay Don Callis El Desperado EVIL G1 Climax G1 Climax 27 A Block Match G1 Glimax 27 Gedo Hiroki Mikami Hiromu Takahashi Hirooki Goto Hiroshi Tanahashi Hiroyoshi Tenzan Hokkaido Japan Hokkaido Prefectural Sports Center Jado Japan Juice Robinson Jushin Thunder Liger Kazuchika Okada Kazuo Yamazaki Kenny Omega Kenta Sato Kevin Kelly Kimihiko Ozaki Kota Ibushi Los Ingobernables de Japon Makoto Abe Marty Asami Michael Elgin Minoru Suzuki NJPW Red Shoes Unno Sanada Sapporo Hokkaido Japan Satoshi Kojima Shinji Yoshino Shinpei Nogami Soichi Shibata Suzuki Gun Taichi Tama Tonga Tetsuya Naito Tiger Hattori Togi Makabe Tomohiro Ishii Toru Yano YOSHI-HASHI Yuji Nagata Zack Sabre Jr.